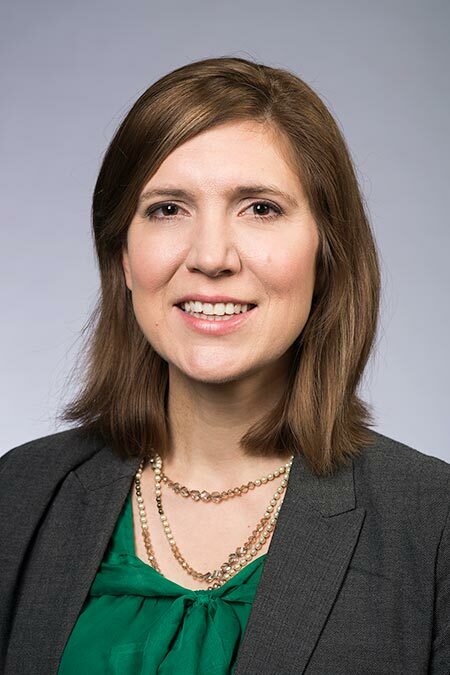 Julia Maddox, director of the new Barbara J. Burger iZone at Rush Rhees Library, talks about iZone’s problem-solving philosophy, what’s stopping many would-be innovators, and how the hub’s intentional design will help foster creative thinking and actions. The 12,000-square foot space is named after Barbara Burger ’83, an alumna and trustee of the University of Rochester, whose lifelong passion for libraries and innovation inspired her support. What’s the iZone’s raison d’être? All humans have the inborn potential to be creative problem solvers. But the reality is that we, and especially young people, are told, “get good grades, get into a good school, get a high salary.” That means we often deprioritize creative pursuits that might otherwise help us unlock true innovations. We are out to prove at iZone that every single one of us is born to be a creative problem solver. Why is the library an ideal space for the iZone? Why in a library? Since the Alexandrian library, libraries have fostered ideation and knowledge creation. The physical location inside the library keeps the doors open for everybody. We don’t have an allegiance to a discipline or school, we are open to all, we are accessible to all. We’re also, physically, a point of access, a meeting space. We wanted a space where every single student, no matter if they were a business major or an anthropology student, would feel welcome and could have ownership and pride in the space. What exactly happens at the iZone? We have a peer-led model led by undergraduates and graduate students who provide tools to help other students explore their ideas. In addition to one-on-one consulting to help students get started, we also offer workshops and programs such as project management, design thinking, pitching and brainstorming —things that they can walk away with and feel they immediately have something in their tool kit. Design thinking is a method for solving problems that starts by empathizing with real people. Before coming up with concrete ideas, we first spend time really understanding the people who experience a problem—talking to them, shadowing them, learning from them. Only then, when we have a human-centered understanding of the challenge that we’re trying to tackle, do we start to come up with possible solutions. Design thinking encourages us to brainstorm really crazy, previously untapped ideas for resolving that problem and then to quickly experiment with that idea by building it, by sketching it, by acting it out, tweaking it—and maybe burning it all down if we realize it wasn’t a good idea after all. Truly innovative ideas lie somewhere between the expected and the impossible. At iZone, we help students hunt for those ideas, the ones that are just so crazy they might work. Ten years ago, would we ever have imagined going to a city and staying in a stranger’s house? Or summoning a stranger on our phone to have them come and pick us up in the car? You cannot come up with groundbreaking ideas if you do not allow yourself to wander around in the zone of the unknown. So much of what we do at iZone is helping students develop the mental muscles they need to come up with those ideas. It’s the idea of intentionally putting together a team of people that you would never imagine would work well together. You need to remain open-minded to the fact that someone with a different skillset, opinions, background, and expertise might bring something to the table that challenges your way of seeing the world, something that might even turn your assumptions upside down. We are idea-agnostic. We are not here to judge whether an idea is important enough or whether a problem is worth solving. We believe that if an idea improves the life of one person, even in a small incremental way, then it’s worth tackling. How about you—do you walk the walk? Of course! Our team is always experimenting with crazy ideas for bringing our mission to life. 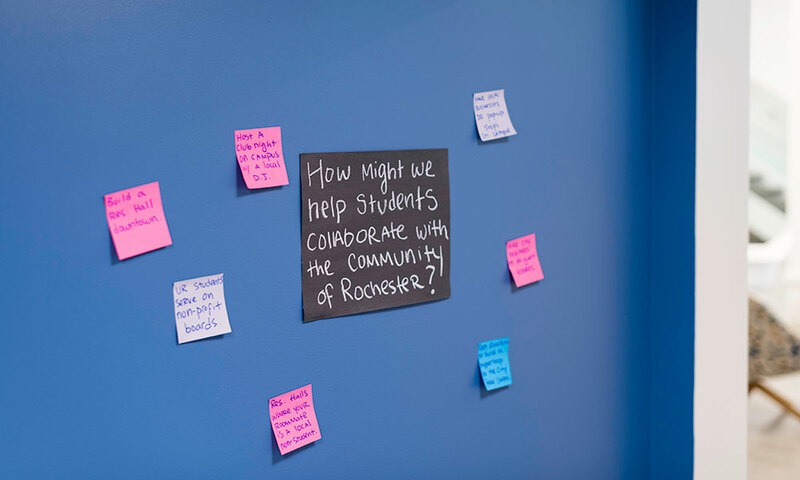 Our office is littered with sticky notes of our great (and not so great) ideas for helping students explore ideas for social, cultural, community and economic benefit. We like to say that the only constant at iZone is change. When a program isn’t working, we either tweak it or kill it, and our student employees are empowered to push back at me whenever they think I’m off target. We will only succeed in our mission if experimental, creative, multidisciplinary collaboration is baked philosophically into everything we do.